Learn English in a high-quality academic institution, with access to campus services and to extensive social, cultural, and recreational opportunities through Experience Manitoba Activities in our Intensive English. The Intensive English Program has monthly start dates and offers seven levels of English language learning from low beginner to advanced, helping you to build your confidence in using English in academic, professional and social settings. If you’re new to English or just want to enhance your reading, writing or speaking abilities, we’ll find your fit. IE offers seven levels of English classes from beginner to advanced. Feel confident to communicate in academic, professional and social settings. Start by taking an online placement test to determine which level is best suited for you. Discover Canadian culture and explore ‘Friendly Manitoba.’ Jump in one of our 100,000 lakes, take in various festivals, bundle up for a winter activity, or get loud at one of our professional sporting events. You also have the opportunity to travel off-campus and to other parts of Canada to enrich your experience. 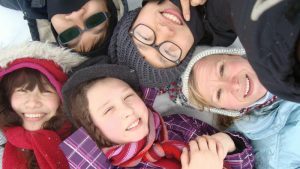 Live on campus with domestic and international students, or live with a homestay family to get a real taste for Canadian family life. You will also have access to all of the university services. Prepare for university study and develop your conversational English at our Conversation Café, Language Partner or by interacting with our diverse population of students and staff. With Intensive English you get all of the advantages of studying at the University of Manitoba. Each IE session takes two months to complete and consists of 192 hours of instruction. Students who have completed 15% or less of their programming qualify for a 50% tuition refund. Application and accommodation fees are non-refundable. Tuition fees include tuition, access to computer labs and libraries on campus, as well as transportation and admission to all Experience Manitoba events. The programming fees are due 30 days before the start. A cover letter, unofficial transcript and an IEP course reference guide will be mailed to you approximately 6-8 weeks after your program end date. Once you have successfully completed both modules I and II in levels 0600 and 0700, you are eligible for the Certificate in General Competency in English (CGCE). If your visa application is denied, we are prepared to issue a full refund minus the $300 application fee. How many levels in Intensive English? We have 7 levels in Intensive English, from Beginner to Advanced. After I send in my application and pay my deposit, how long do I wait for my letter of acceptance? After receipt of your application and deposit payment, your registration will be processed within 5-10 business days. A copy of your letter of acceptance will be sent to you by email. Download and submit a completed Application Form (PDF). or by email: extended@umanitoba.ca Payment of programming and accommodation fees are required one month prior to the start of the session. Students who fail to pay their fees will not be allowed to attend classes until payment is received in full. The University of Manitoba will post the Canadian dollars equivalency to your student account. Prior to starting Intensive English, an online placement test is taken to determine the English proficiency level of students. Students are then placed in a level best suited to their English ability. The test must be taken online prior to arrival. Instructions to take the test will be sent to new students upon acceptance. Students will receive their test results on the first day of orientation at the University of Manitoba. It’s highly recommended that you take the test before arrival. If for any reason it’s not possible to take the online test before arrival, arrangements must be made to write the test at the University of Manitoba on orientation day. Placement test instructions For more information about the online placement test please email iep@umanitoba.ca. As an International student with Extended Education at the University of Manitoba, you are required to get your own health care plan. 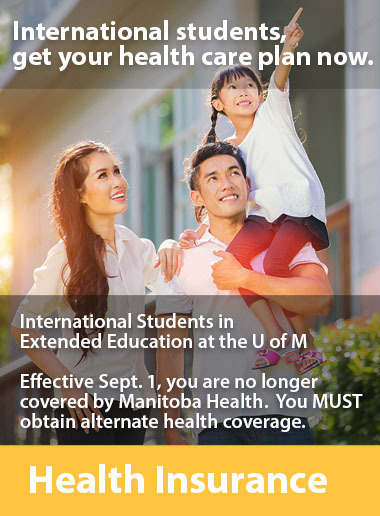 Effective Sept. 1, 2018, the Manitoba government no longer covers international students in Extended Education under Manitoba Health. All current and future students are required to obtain alternate health coverage. Get your health care plan now. Our Experience Manitoba Activities help you to use the English you have learned in the classroom in the community.